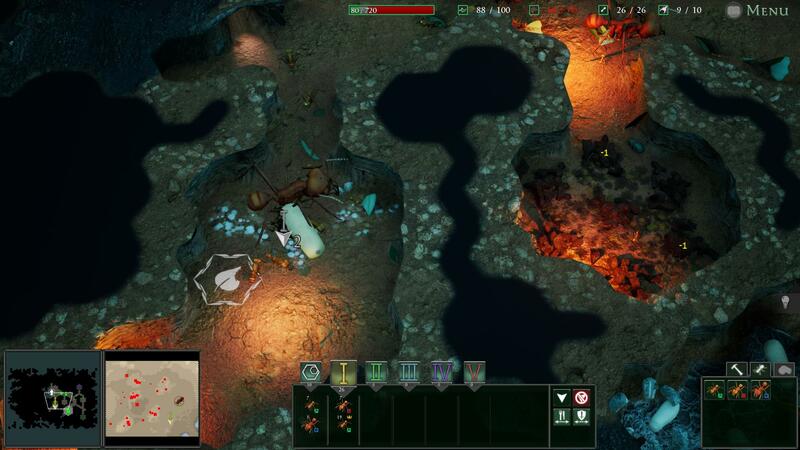 It's time to show some of the interface and mechanics changes necessary to bring these fascinating ants to Empires of the Undergrowth. You can see leaf drop-off and refuse chambers - the leaf drop-off chambers look like the regular food chambers. Ants collect leaf cuttings from outside and take them to the drop-off points, which the minims then process further by taking to the brood chambers, where they become the fungus the ants can feed on. Over time, the fungus produces waste which must be removed and taken to special chambers (right of the first picture). The refuse chambers will have a detrimental effect on nearby brood chambers, so it's wise to build them a good distance away from where your ants pupate and travel - non-minim ants walking through them will take a speed and attack de-buff as well as suffer damage for a time. You'll notice a new resource bar at the top of the screen in both pictures. Green on the left represents fungus available to spend, grey is space available on the nursery tiles to grow fungus, and red on the right is used fungus that needs to be taken to a refuse chamber. 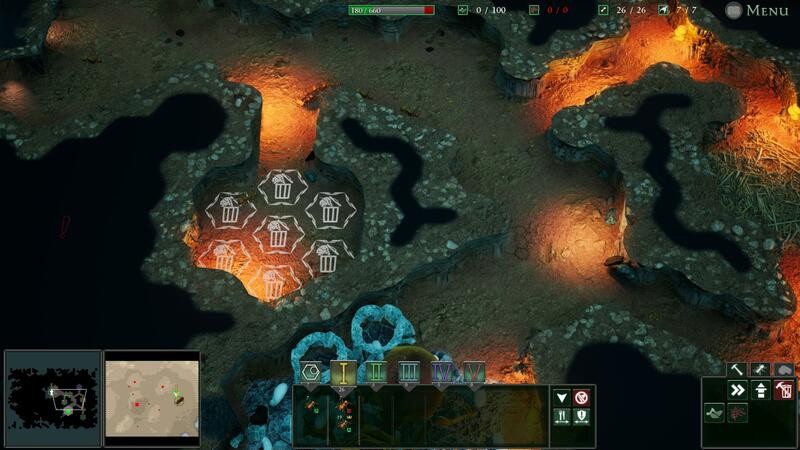 Refuse decays and disappears over time - faster for upgraded refuse tiles. Can't wait for the release !! Why are normal food tiles there in the second image? The same texture is used for the leaf storage. We didn't see a need to make a new one. Also in the first image why is there only three ant tiles? Baced of that there are 4 different cinds of leafcutters. Can someone explain please? Minims come free with other tiles so you don't need to put down special tiles for them. Are they free to hatch? How many will hatch for every brood tile? And do they get upgraded if you upgrade the tile they come from? From what I've read the minims will not upgrade, not be controllable and not take part in any fighting action. They're basically cosmetic entities. Correct about minims not upgrading or being directly controllable, but they do carry out the important tasks of taking leaf cuttings from drop-off chambers to brood chambers, then the resultant waste to the refuse chambers. They're the only leafcutters that can enter a refuse chamber without any detrimental effect. Wait, can't we make Minims ? Well yes you can, you get one free with every tile of the other ant castes (minors, mediae, majors). They'll hatch from the same tile. They're the only leafcutters that can enter a refuse chamber without any detrimental effect. What do you mean by detrimental effect ? is that a slow, a damage, does this affects other critters ?